We do not accept returns due to placards being created to order. We do accept returns in the case that the item is damaged. Item must be returned within 48 hours of delivery. If the Official Vessel Number is printed incorrectly on your placard due to an error on our part, we will replace it free of charge. 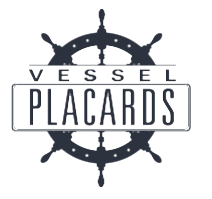 If you purchased your placard with an incorrect Official Vessel Number, we cannot offer a refund. Shipping fee is $15 Flat Rate for the United States. If you require Express or Overnight Shipping, please contact us for arrangements. Additional fee applies.